I had a pair of domain controllers named DC and DC2. My OCD hates that one server used a number, and the other didn’t. My desired outcome is having the servers named DC1 and DC2. The “DC” server also controlled DHCP in a non-redundant fashion for everything in the house (lab and non-lab). I wanted to push that up to my Meraki MX60W to shift the service away from the core lab components and onto something that only rarely has planned maintenance. Even if my Meraki does go down, it means the Internet gateway is also down, and I’ll have bigger fish to fry. Using the Meraki also means no more DHCP relays from the home networks into the lab networks. I will still use isolated DHCP servers for other projects (such as Razor) but those are purpose-built. I decided to break the activities into three major steps. 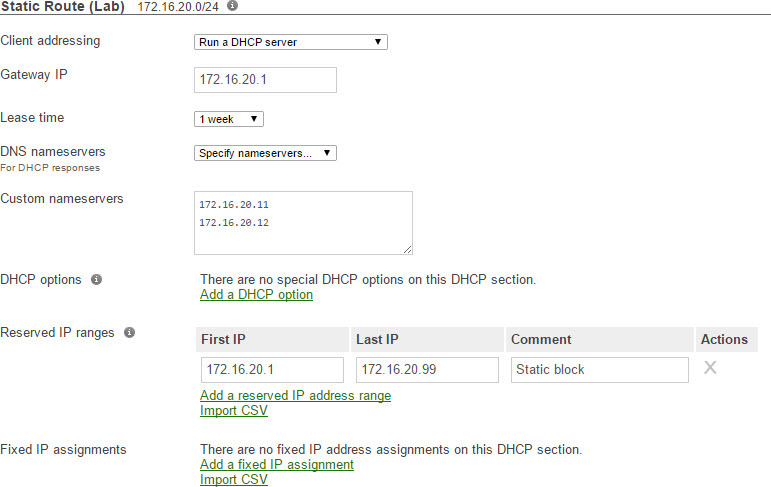 I figured it would be best to start with the easy stuff: moving DHCP. Because my lease timers are set rather high (7 days), I wasn’t too worried about doing this during production. DHCP clients tend to check in when their lease is half way towards expired, so I could be reasonably certain that I had 3.5 days remaining to get this migrated. Plenty of time! Gateway IP: The SVI on my Layer 3 switch, which is 172.16.20.1 for VLAN 20. Lease time: 1 week (7 days) to match the old timer. DNS nameservers: I used my own internal domain controllers, which are also AD integrated DNS Servers. This allows the clients to resolve the glacier.local domain. DHCP options: None were required, but if you needed them for PXE or VoIP environments, stick ’em here. Reserved IP ranges: This was a bit backwards from what I’m used to. Instead of specifying a block of dynamic IPs, you instead set an exclusion range. I reserve the lower 100 IPs in the fourth octet for static, giving me 154 addresses for DHCP. Should be plenty and it’s an easy way to spot a static vs dynamic address without looking at the configuration. Because this VLAN is not directly connected, I needed to set up a DHCP relay on my Layer 3 switch (an HP V1910) to forward requests to the Meraki. I use a small /29 subnet to route from the Meraki to the HP (VLAN 99). I constructed a relay to 172.16.99.1, which is the internal (southbound) L3 address on my Meraki, to handle DHCP requests from the lab’s VLAN 10 and VLAN 20. I released the DHCP lease on a client and made sure that it acquired a new lease via the Meraki. Head to the Meraki Dashboard > Monitor > Event Log and filter by DHCP to see lease activity. 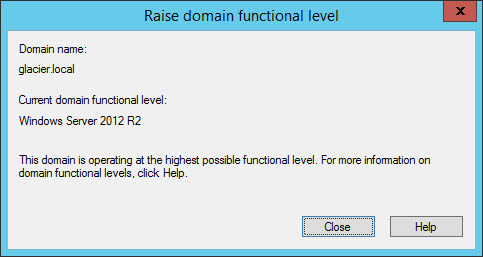 Now that DHCP services are migrated, I crafted a new domain controller named “DC1” using a Windows Server 2012 R2 image. I had to start with this server because there was already a “DC2” server and I didn’t want to run with a single domain controller. I went ahead and transferred all five of the FSMO roles to the new “DC1” and did a number of health checks on DNS and AD to ensure the forest and domain were healthy. I then pointed all of the client DNS entries to the “DC” and “DC1” servers. The “DC2” server was decommissioned. 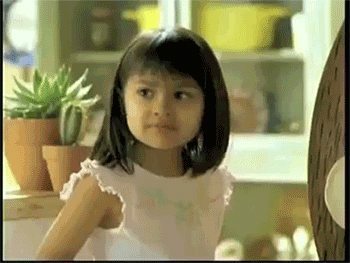 I used a simple script to update DNS entries for anything within AD that classified as a computer object, while allowing a DHCP refresh to tackle the rest with updated DNS entries. I could have just waited for the final domain controller to be rebuilt, but I didn’t want things to start timing out because they were pointing to a dead DNS server. Here’s a gist of the script that I used. The final activity was to repeat most of Step 2. This time, the new server was called “DC2” and the decommissioned server was that original “DC” server. 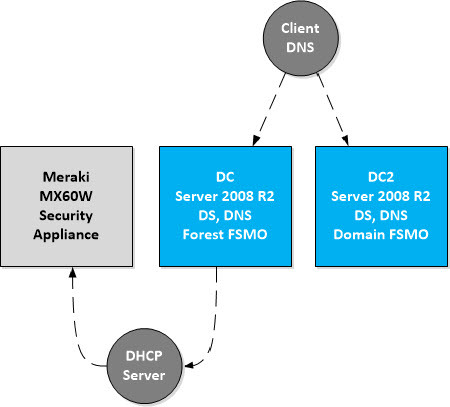 Once completed, I split FSMO roles: “DC1” would take on the forest roles, while “DC2” would handle domain roles. Each is a global catalog server. I then did a health check and updated the DNS client entries once more. 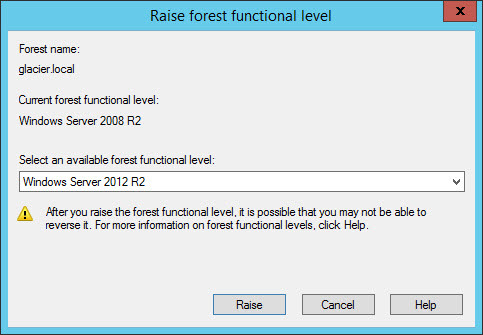 The last part was a functional level update to Windows Server 2012 R2. It could be debated if it would be better to actually have an internally working network (get DHCP lease) even if internet is down… (merkat is dead/down). Makes it easier to do some level of troubleshooting.. instead of having to set static IPs; not that it’s difficult, but still.. It boils down to design I guess. All good points. I figured 3.5 days (worse case) would be plenty, and the management VMs do use static addresses. It’s just the lab stuff that relies on DHCP. Good catch on the Gist; I’ve supplied some of the string variables I used in the JobVars file directly. Why not both? Put half the range on the Meraki and half on the DC so they are redundant for each other? The home equipment would then have to traverse into the lab, which goes through the Meraki.